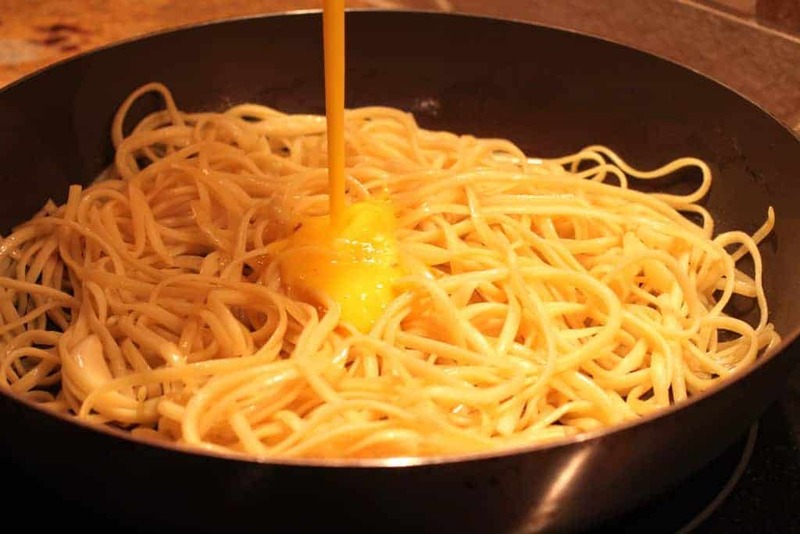 Egg and cheese pasta may sound simple and boring. Simple? Yes! Boring? Not a chance. I love bestovers. Making something out of what’s on hand. 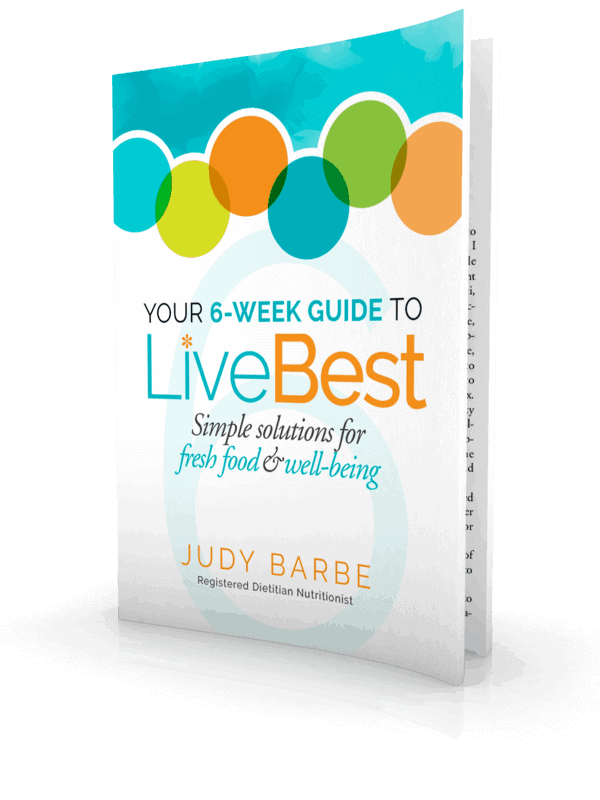 (Check out more recipes and tips to use what you have on hand and reduce food waste.) This dish is quick to make and costs just pennies. I love that! Needless to say, this is a favorite at my house. I’ve used linguini, but don’t let the shape stop you. Spaghetti, penne, even macaroni works. It’s a takeoff on a classic Carbonara – the Italian dish of spaghetti with a cream-egg-Parmesan cheese-bacon sauce. You can make that too, if that’s what your leftovers look like. Protein-packed eggs and cheese give this dish staying power. The pasta carbs give you a shot of energy. All together you have a dish that will keep you fueled for a few hours. flavorful cheese. I use Parmesan, but Romano or goat cheese are possibilities. vegetables. Sautéed asparagus, mushrooms or cherry tomatoes… Yum! 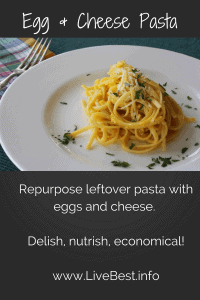 Repurpose leftover pasta with eggs and cheese. Delish, nutrish and economical. 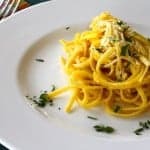 You may start making extra pasta just so you can enjoy egg and cheese pasta. In a separate bowl, stir the eggs, water, and red pepper flakes together. Add butter and olive oil to a non-stick pan. Heat over medium-low heat until the butter melts. Swirl the oil and butter together. When the oil is hot, add the garlic cloves. Pour in the eggs. Gently stir them as they cook. As the eggs start to firm up, add the pasta. Stir to coat the pasta. Sprinkle in cheese and black pepper. 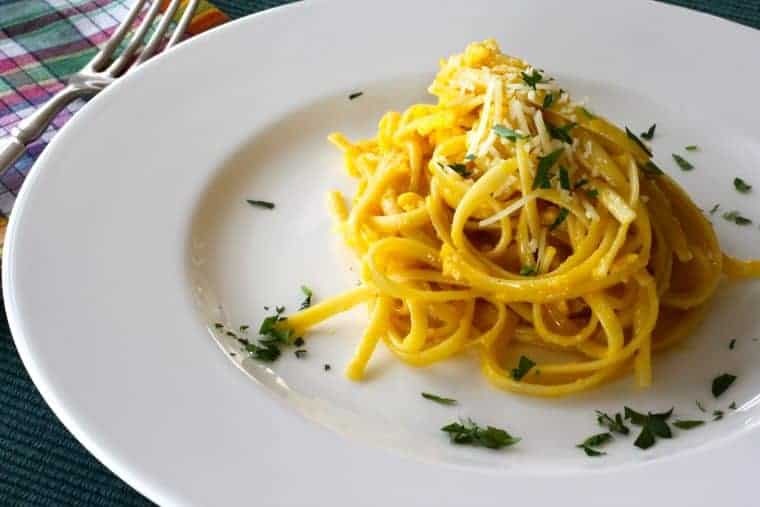 Continue to cook until pasta is heated and eggs are cooked to your preferred doneness.